A hedge fund manager turns up at his own funeral and the Jeffersonian team must try to identify the man who was cremated. Also as the sales of Finn's and Hodgins' hot sauce soars, Finn must deal with some life changes. 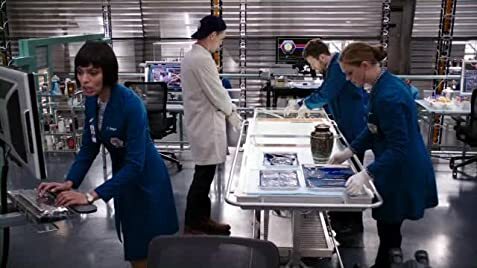 Dr. Temperance 'Bones' Brennan: After Mr. Abernathy and I finished separating the remains that were mixed in with Daniel Barr's, I realized that we're missing parts of the victim. Special Agent Seeley Booth: How? He's ash. Dr. Temperance 'Bones' Brennan: Based on his size, after cremation, his remains should weigh 3 kilograms. We received only 2.31 kilograms. Special Agent Seeley Booth: So you're missing almost 2 pounds of the victim. Why can't you just say "2 pounds" instead of getting all metricky?